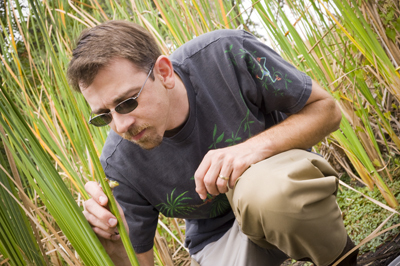 Associate Professor Jason Rohr’s research recently was published in Nature. TAMPA, Fla. -- Emerging fungal pathogens pose a greater threat to biodiversity than any other parasitic group, causing population declines of amphibians, bats, corals, bees and snakes. New research from the University of South Florida published in the prestigious journal Nature reveals that amphibians can acquire behavioral or immunological resistance to a deadly chytrid fungus implicated in global amphibian population declines. “Acquired resistance is important because it is the basis of vaccination campaigns based on ‘herd immunity’, where immunization of a subset of individuals protects all from a pathogen,” said Jason Rohr, an associate professor of integrative biology who led the research team with Taegan McMahon, a USF alumna who is now an assistant professor of biology at the University of Tampa. One experiment in the study revealed that after just one exposure to the chytrid fungus, frogs learned to avoid the deadly pathogen. In subsequent experiments in which frogs could not avoid the fungus, frog immune responses improved with each fungal exposure and infection clearance, significantly reducing fungal growth and increasing the likelihood that the frogs survived subsequent chytrid infections. "The discovery of immunological resistance to this pathogenic fungus is an exciting fundamental breakthrough that offers hope, and a critical tool for dealing with the global epidemic affecting wild amphibian populations," said Liz Blood, program officer in the National Science Foundation's Directorate for Biological Sciences, which funded the research through its MacroSystems Biology Program. The study’s team included: USF researchers Brittany Sears, Scott M. Bessler, Jenise Brown, Kaitlin Deutsch, Neal Halstead, Garrett Lentz, Nadia Tenouri, Suzanne Young, David J. Civitello and Nicole Ortega. ; Matthew D. Vensky of Allegheny College; J. Scott Fites, Laura K. Reinert and Louise A. Rollins-Smith of Vanderbilt University; and Thomas R. Raffel of Oakland University.